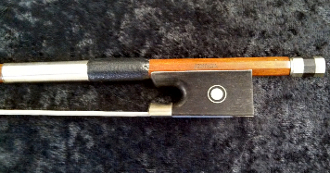 This full size American - made violin bow for sale comes from JonPaul Bows and was made in 2009. This is a JonPaul Brazilwood Violin Bow, and it has a nice round stick with fitted ebony frog. While it is clearly a beginner bow, this bow is a substantial upgrade from a fiberglass or beginner rental bow in terms of handling and playability. It is a good value bow, as many fiberglass bows are similarly priced. This JonPaul is a new bow, and in excellent condition; it has no faults from production. For $75.00, this beginner level bow would be a good choice for an aspiring violinist.